LifePoint Health CEO Bill Carpenter will retire after the Brentwood, Tenn.-based health system completes its merger with RCCH HealthCare Partners, LifePoint announced Wednesday. David Dill, LifePoint's president and chief operating officer, will take over as CEO of the merged company. The merger, announced in July, is expected to close later this year. "It has been an absolute privilege to lead LifePoint for nearly 13 years, and to be a part of the team since the company's inception almost 20 years ago," Carpenter, who will join the merged company's board of directors, said in the announcement. "I am incredibly proud of all the organization has accomplished during that time." 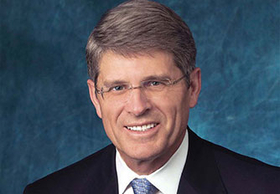 Carpenter has served as LifePoint CEO since 2006 and became chairman of its board in 2010. He has been with LifePoint since it was formed in 1999 when HCA Healthcare spun off 23 rural hospitals. Carpenter, whose first career was as a lawyer, helped grow the system into the 68-hospital chain with annual revenue exceeding $6 billion that it is today. Carpenter spearheaded LifePoint's pending $5.6 billion merger with RCCH, which together will have 84 non-urban hospitals in 30 states, regional health systems, physician practices, outpatient centers and post-acute service centers. The company will also have 7,000 affiliated physicians, about 60,000 employees and more than 12,000 licensed beds. Dill joined LifePoint in 2007 as its chief financial officer and became president and COO in 2011. The company credited Dill's leadership with driving improvements in patient safety and quality, and launching LifePoint's national quality program in collaboration with Duke University Health System. "I believe that LifePoint is better positioned than ever to be the leader in non-urban healthcare, and to help define what the delivery of community-based healthcare looks like in the future," Dill said in the announcement.